Have you ever had a tragedy happen in your life that changes you forever? These trials can begin for many reasons such as a prodigal son or daughter, a sudden death in the family, you are injured in a car accident, you receive an unwanted medical diagnosis, or your spouse cheats on you. Life can be going smoothly, then all of a sudden, this tragedy strikes. Sometimes these events can lead to a crisis of faith, depression or the feeling that God has abandoned you. I have heard these types of tragedies referred to as a Job trial, “Dark Night of the Soul”, discipline from the Lord and many other names. If these tragedies can cause so many to have a crisis of faith or doubt the existence of God, why does God allow them? The Bible says the Lord allows us to suffer to bring us joy and strength after the trial is over. “ Beloved, do not think it strange concerning the fiery trial which is to try you, as though some strange thing happened to you; 13 but rejoice to the extent that you partake of Christ’s sufferings, that when His glory is revealed, you may also be glad with exceeding joy” 1 Peter 4:12 (NKJV). “Therefore humble yourselves under the mighty hand of God, that He may exalt you in due time, 7 casting all your care upon Him, for He cares for you.8 Be [a]sober, be [b]vigilant; [c]because your adversary the devil walks about like a roaring lion, seeking whom he may devour. 9 Resist him, steadfast in the faith, knowing that the same sufferings are experienced by your brotherhood in the world. 10 But [d]may the God of all grace, who called [e]us to His eternal glory by Christ Jesus, after you have suffered a while, [f]perfect, establish, strengthen, and settle you” 1 Peter 5:6-10 (NKJV). I injured my neck in a car accident 16 years ago. Ever since, I have suffered from various stages of neck pain. Sometimes I hurt so badly that I can’t do anything but sit in a chair. It is during these times that I grow especially close to the Lord through Bible study and prayer. I have prayed many times for healing, but God has chosen not to at this time. As a result of all these years of suffering, I can see that God has transformed me into a person who cares for others when they suffer. At the age of 30, I was busy, busy, busy with two small children. I went through the motions of Christianity by going to church and saying token prayers, but my life was full of myself and my family. Now I actually enjoy the times of recuperating that I go through because I have an excuse to spend extra time with the Lord. If I had not been in a car accident, I would not be writing this blog page because I would have been too busy to care about you and your problems. Now I desire to use my own trials to help you with yours. “Therefore I am well content with weaknesses, with insults, with distresses, with persecutions, with difficulties, for Christ’s sake; for when I am weak, then I am strong” 2 Corinthians 12:10. Instead of asking God to end your trial, ask Him what He wants you to learn from your trial. 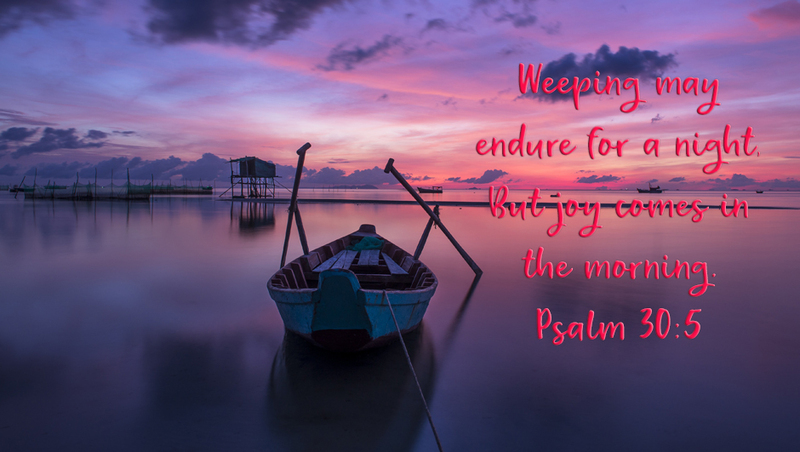 Remember that “weeping may endure for a night, But joy comes in the morning” Psalm 30:5 (NKJV).